WASHINGTON, DC, February 10, 2016 (ENS) – Setting a new annual record, renewable sources of power, such as hydro, wind and solar, accounted for almost two-thirds of the new electrical generation placed in service in the United States during the 2015 calendar year. For the first time, installed electrical capacity from non-hydro renewables (108.34 gigawatts) has now eclipsed that of nuclear power (107.03 GW). The latest monthly “Energy Infrastructure Update” report from the Federal Energy Regulatory Commission’s Office of Energy Projects shows that 69 new units of wind power accounted for 7,977 MW of new generating capacity – nearly half of all the new capacity installed last year. Generating capacity is not the same as actual generation of power. That is a third more than the 5,942 MW of new capacity provided by 50 units of natural gas. Among the other renewable sources, solar placed second with 2,042 MW followed by biomass with 305 MW, hydropower with 153 MW, and geothermal steam with 48 MW. FERC reported no new capacity at all for the year from nuclear power, just 15 MW from oil and only 3 MW from a single new unit of coal. So, new capacity from renewable energy sources during 2015 (10,525 MW) is more than 700 times greater than that from oil and over 3,500 times greater than that from coal. Renewable energy sources now account for 17.83 percent of the total installed operating generating capacity in the United States: hydropower = 8.56 percent, wind = 6.31 percent, biomass = 1.43 percent, solar = 1.20 percent, and geothermal steam = 0.33 percent. The share of total installed capacity from non-hydropower renewables (9.27 percent) now exceeds that from conventional hydropower (8.56 percent). When FERC issued its very first “Energy Infrastructure Update” in December 2010, renewable sources accounted for only 13.71 percent of total installed operating generation capacity. Over the past five years, solar’s share has increased 12-fold (1.20 percent vs. 0.10 percent) while that from wind has nearly doubled (6.31 percent vs. 3.40 percent). During the same period, coal’s share of the nation’s generating capacity decreased from 30.37 percent to 26.16 percent. The American Wind Energy Association, AWEA, says wind power now supplies enough electricity for 19 million American homes. 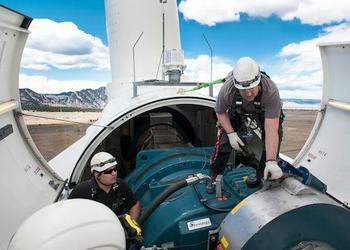 Installed capacity in the United States is now nearly 75 gigawatts, in the form of 52,000 turbines. “Wind energy could double to supply 10 percent of the U.S. electricity mix by 2020, and double again to supply 20 percent of U.S. electricity by 2030. It can become one of the largest sources of electricity in the U.S. by supplying 35 percent by 2050,” the association says. “According to the Department of Energy’s Wind Vision report, by meeting the 2030 scenario American wind power could support 380,000 well-paying jobs, a number that could grow to 600,000 by 2050,” says AWEA. 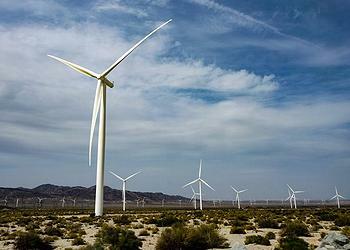 As of July 2015, more than 100 wind projects were under construction in 24 states, representing more than 13,600 MW of total wind capacity and over $20 billion worth of private investment, said AWEA. The majority of new wind construction activity is in Texas, with Oklahoma, Kansas, Iowa, and North Dakota also benefiting from new investment. On the solar side, the U.S. installed 1,361 megawatts (MW) of solar photovoltaics in the second quarter of 2015 alone to reach 24.1 gigawatts of total installed capacity, enough to power five million American homes.